Don’t you just love boots? 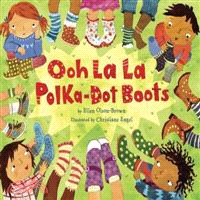 This exuberant celebration of polka-dot rain boots lets readers “dress” a cheerful romp of children so that everyone gets to wear their favorite footwear with every outfit, in every activity. Get your polka-dot boots on! ELLEN OLSON-BROWN has always loved children, words, silliness, and fun footwear. As a preschool and kindergarten teacher, she loved seeing her students skip and splash in colorful rainboots no matter what the weather. Ellen’s twin sons loved their own yellow rubber ducky boots so much that they even slept in them at night! Ellen is the author of Ten Stinky Babies, Hush Little Digger, and Bake You a Pie, all Tricycle Press titles. She parks her own blue- and red-flowered rainboots by her front door in Groton, Massachusetts. CHRISTIANE ENGEL has illustrated many children’s books. About this book she said, “I was really inspired by the fun text, so I created different kid characters for each page—some who like it neat and some who prefer to be muddy, kids with a strong spirit of independence, and kids with a unique or quirky sense of dressing and choosing their accessories.” Christiane lives in London.